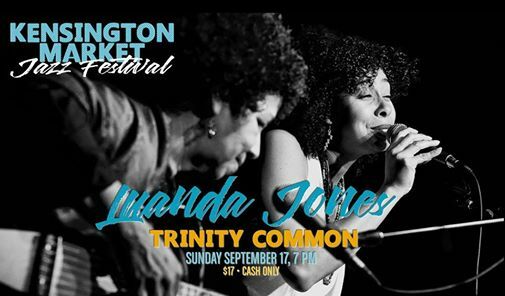 Luanda Jones at Trinity Common features touring Brazilian jazz superstar Irinéa Maria Ribeiro on guitar and vocals, Gord Sheard on piano, Paco Luviano on bass, Alan Hetherington on drums and Luanda Jones (voice). Come and check the last concert of Irinéa and Luanda in Toronto- mom and daughter singing together- before Irinéa comes back to Rio de Janeiro. As a monumental celebration of her successful and incredibly storied career, Ribeiro entered the studio with a number of her fellow singers and musicians to record 50 Years of Song, her first album of original compositions in her five decades in music. The 15-track collection, written and performed by the Rio de Janeiro native presents a varied selection of songs representing the musical diversity of Brazil’s MPB sceneAs a songwriter, producer, and music director, Irinéa Maria has been a fixture in the Brazilian music since the boisterous early ‘60s. Her music has been recorded by a notable roster of influential artists and musicians including Zezé Motta, Tim Maia, Sandra de Sá, Maria Creuza, Cauby Peixoto, Jane Duboc, and many others. 50 Years of Song calls on the talents of an equally esteemed list of musicians anyone would be honored to have with them in the studio including Kiko Continentino, Itamar Assiere, Antonio Adolfo, Fernando Merlino, Rômulo Gomes, Marcio Iacovo, Max Dias, Jorge Roberto Martins, Célio Balona, and Jean Charneax.